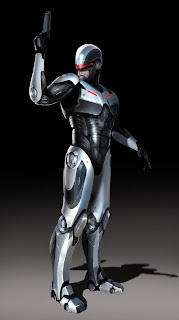 So far I've been fairly unbiased about the news for the upcoming Robocop remake. I knew it was being remade and was incredibly excited to see which direction they took it. I knew that Jose Padilha was helming it. But I had no idea who he was so I had no opinion. And a few weeks ago they announced that Joel Kinnaman (The Killing) was going to be donning the iconic helmet. I've only seen him in The Darkest Hour and I barely remembered him from it, so I didn't have an opinion to give. But, today I read some new news and decided it was time to speak up. "Our vision of how a robot is going to be in 2046, it's going to be a very human skin, it's gonna look very human." ...and died a little inside. Human?!? 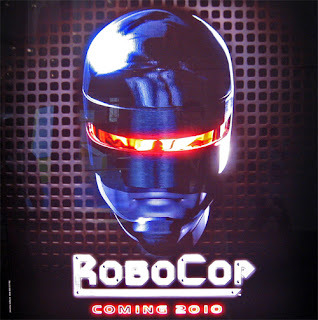 Robocop can't look human! At first I just thought it sounded stupid. Why would you want to see a robot cop that looks like a human? Just go watch The Blade Runner or something. One of the things that make Robocop so appealing is his sweet design. He is definitely a recognizable character. But, I was thinking some more and thought the following: By making him look more human, they are compromising his character. One of the main themes of the original classic was Alex Murphy's fall from human and his slow journey to regain his humanity. The reason his journey was so hard was that he only had a few fragmented memories and his face. But, other than that, he was a machine. He could never regain his former life as Alex Murphy. While he regained his humanity, he could never be human again. But, if they make him "look very human" than that...um, well...makes him human. I see that whole struggle going out the window. If he looks human and still has his memories, what is going to keep him from going back to his life as Alex Murphy? That was the whole character's arch. If he doesn't fight for that, then what will he fight for? I don't know; maybe it will all make sense once I see the final product. I still have hopes for the remake and am looking forward to it. But, now the next big question is: Will ED-209 be in it...? What Makes a Viral Video?